Since last couple of weeks at solvemyhow, I'm talking about blog monitizations techniques and this tutorial is also a part of it. 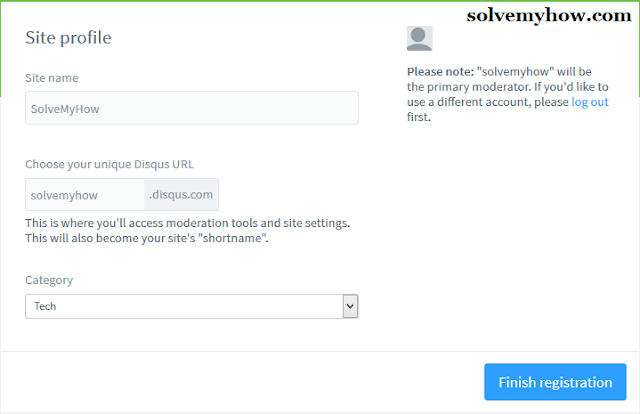 Before installing disqus comment widget/plugin into your blog, I just wanted you to explain why you need to switch from default blogger comment system. The default blogspot comment system is nice and many people are satisfied with it as it is neat and clean but have you ever thought what if people wanted to comment on your blog using Facebook, Twitter, etc different social media sites as they might do not have google account ? In this case you might loose those valuable comments from your loyal readers as they are only allowed to comment on your blogspot blog using google account, Open ID, Name/url etc of which they might even not have heard. So, in this case you need to install disqus on blogger blog. The installations is pretty easy and it doesn't required any technical knowledge. You just have to follow step by step guide mentioned below and have to click on few buttons that's it, it will automatically be installed on your blog. Before adding disqus, I just wanted to share few advantages of using it. So, these were some advantages of using disqus. Now lets add it on your blogger blog. Just click on the above link and you will be redirected to sign up form. Just fill up the form enter your email id and password and click on "Next Step" button. After entering all the information just click on "Finish registration" button. 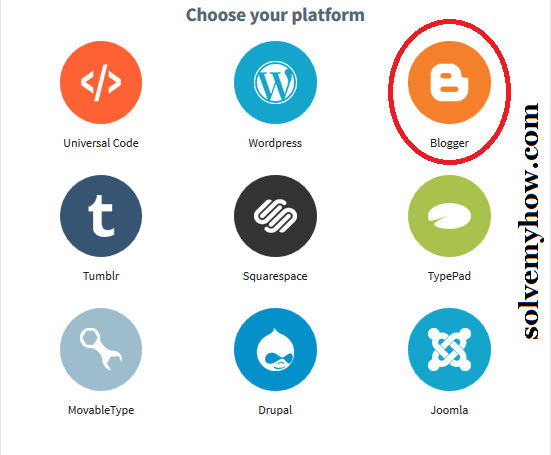 Here you have to click on "blogger" logo. Now you will be redirected to another page where you will get setup instructions for blogger. 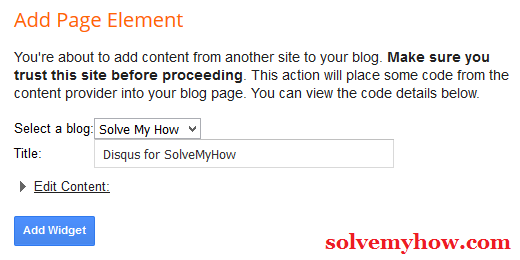 You will get the same button like "Add SolveMyHow to my Blogger site". Simply click on that button and new tab will be open. Login to your blogger account and simple click on "add widget" button and disqus will automatically be installed on your blogger. Here you might be thinking what about previous comments right ? Don't worry you can also take backup of your previous comments. Look at the snap shot above and click on Tools > Import. Step 2 :- Click on "Imports comments from Blogger"
After clicking on Tools > Import you'll be redirected to new window and then just click on "imports comments from blogger". Step 3 :- Allow the access. After clicking on "imports comments from blogger" it will take you to the new window where it will ask for your permission to access your blog data. Simple click on "Allow" button. After granting the permission, redirected back to "Tools > Import" page and now you will be able to see the new option i.e "choose a blog to import from". Simple select your blog and click on "import" button. P.S all the old comments will be available on your blog once disqus team completed processing it. That's it. Congratulations, you've successfully installed disqus comment widget on your blogger blog. 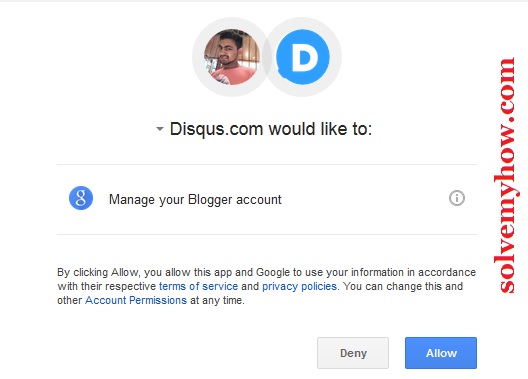 So, this was all about how to install disqus on blogger. I hope you found this tutorial informative and worth reading. Please feel free to ask any query about this widget in the comments below. I would be happy to answer it. Also consider sharing this post with your social media friends on Facebook, Twitter and Google plus. P.S you can also subscriber for solvemyhow newsletter to get latest updates about blogging widgets, SEO and hacking tips and tricks right into your inbox. 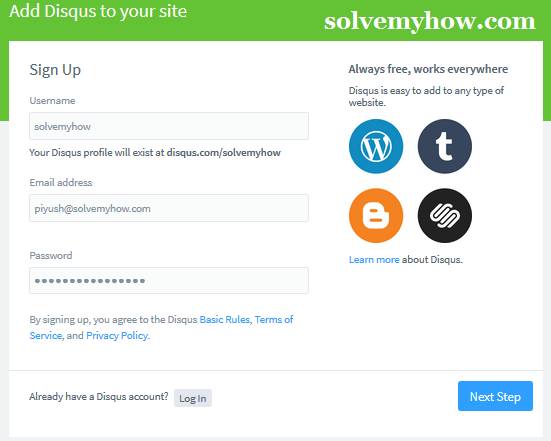 Disqus is a good readymade plugin, and easily can install in our blog. But one should take before accept the comment approved by site admin in the checklist. Otherwise, will face lots of spam comments.. Thanks for stopping by and commeting. Charan thanks for your great feedback. I appreciate that.